Table Rentals | FroggyHops.com Minneapolis MN. Events require tables! Tables for food. Tables for gifts, Tables for seating. Even tables for photo displays and cakes. Be sure to reserve several tables for your upcoming event! Tables come in a bright white color that lends well to the use of tablecloth covers or the use without! Each table is light-weight and can easily be carried by 1-2 people across your yard or into your garage. Assembly of your table rental is easy and seamless! Arrange your tables however you need or take advantage of one of our table layouts below! 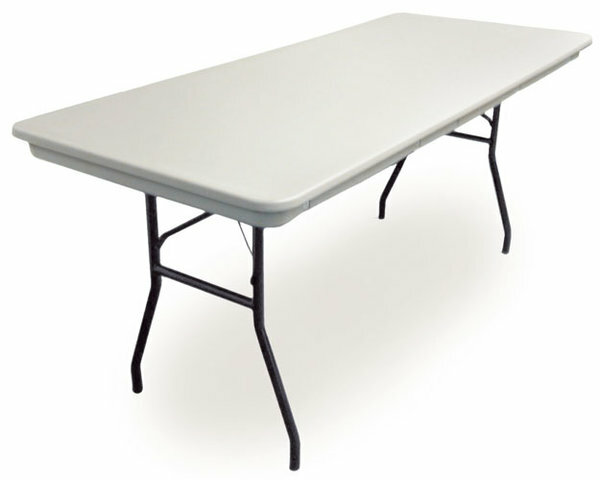 Table seating lay-outs are designed to fit under a 20' x 20' tent rental. Tents and chairs rented separately. Tables come delivered to the curb. Set-up service avaialble! You will be prompted to reserve table setup during online reservation.